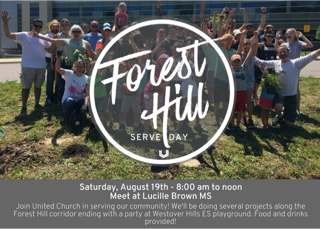 This Saturday, August 19, United Church will hold a Forest Hill Corridor Serve Day, partnering with the city, organizations, businesses, families, and individuals to help tackle some projects that could use a little TLC along Jahnke Road. Any one and every one is invited to participate. Participants will rally together at Lucille Brown Middle School at 8 a.m. before heading out to assigned projects. Donuts will be provided by the Treat Shop. Tools will be provided by the Richmond Tool Bank. The group will reconvene at Westover Hills Elementary School around noon to celebrate with food, drinks, and a DJ provided by United Church. This is not a United Church only event; the church wants to partner with the entire community. The more volunteers sign up, the bigger the impact. 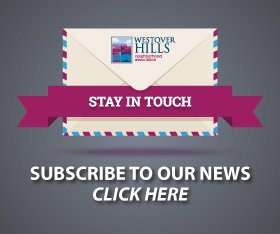 The Summer Reading Finale at the Westover Hills Branch Library will be held Saturday, August 12, from 2 to 4 p.m. Did you finish your summer reading? TERRIFIC! Now celebrate with drop-in crafts, snacks and more. Children under 10 should be accompanied by an adult. Join 4th District City Council Member Kristen Larson for an Ice Cream Social on Sunday, August 13, from 4 to 5:30 p.m. at Forest Hill Park near the Stone House. 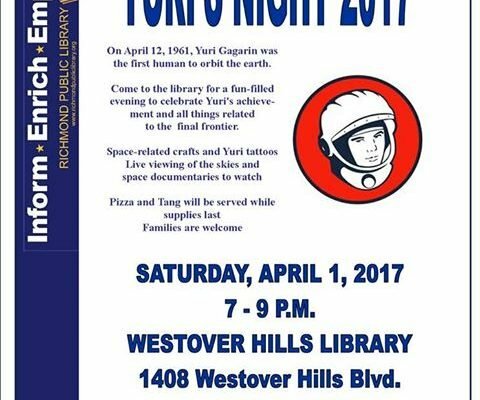 Celebrate the first person in space at Yuri’s Night at the Westover Hills branch Library! Don’t miss this opportunity to learn more about space flight, rocketry, Yuri Gagarin, and, weather permitting, get a peek at the planets and stars. Right here @ your Westover Hills library. April 1, 7 to 9 p.m. Pizza and Tang will be served. Families welcome to this fun and educational after-hours event. 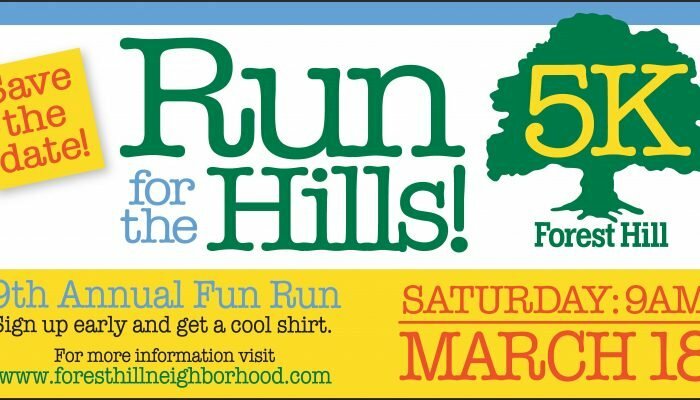 The 2017 Run for the Hills 5K will be run Saturday, March 18, starting at the Stone House in Forest Hill Park at 9 a.m. Register in advance by midnight March 15 ($25) to guarantee you’ll get a race t-shirt! 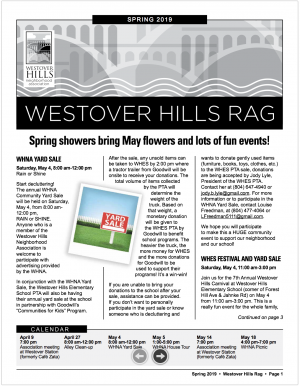 The event is sponsored by the Forest Hill Neighborhood Association. 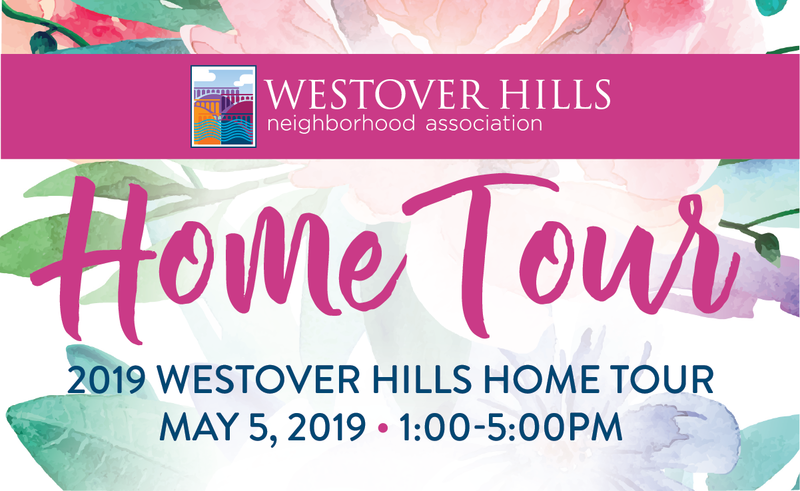 Even if you’re not planning to participate, come out to cheer along the course which winds through Forest Hill and Westover Hills neighborhoods. For more details, click here.